Now that fall is officially in the air, a number of insects and spiders are poised to make their way into Ohio homes. Indeed, with the recent spate of cool temperatures, I've already gotten a few reports of gnat-like Hackberry Psyllids (Pachypsylla spp.) buzzing around homes and various spiders marching across floors. These unwelcomed guests may soon be joined by other notorious fall home invaders including Boxelder Bugs (Boisea trivittatus); Western Conifer Seed Bugs (Leptoglossus occidentalis); Multicolored Asian Lady Beetles (Harmonia axyridis); and the notorious Brown Marmorated Stink Bugs (Halyomorpha halys). The invaders are motivated by seeking sheltered locations where they can spend the winter. These are "cold-blooded" home invaders meaning the speed of their metabolism is mostly governed by ambient temperature: the higher the temperature, the faster their metabolism and the faster they "burn" fat. Yes, insects have fat, but it's confined by their hard exoskeletons so they don't suffer ever-expanding waist lines. These insects feed voraciously in late summer to accumulate fat. They then seek sheltered locations in the fall where cool temperatures slow their metabolism during the winter so they will not exhaust their stored fat reserves. This survival strategy keeps them alive since there is nothing for them to eat throughout the winter. Home invasions occur because of a terrible error on the insect's part. The insects are attracted to the solar heat radiating from southern or western facing roofs and outside walls as well as the warmth radiating from within. This can lead them into attics, outside wall voids, and spaces around door jams and window frames that make perfect overwintering sites. Unfortunately for both the insects and beleaguered homeowners, the insects may occasionally find their way into homes. This is accidental and disastrous for the insects because the high inside temperatures cause them to burn through their fat and starve to death. And, they do not go gentle into that good night! Starving brown marmorated stink bugs and multicolored Asian lady beetles commonly take flight to buzz-bomb astonished homeowners and terrified pets. Spiders are motivated to invade homes in the fall for protection, food, or love. As with home invading insects, some spiders enter homes in search of protected winter quarters. Others may find their way into homes while seeking prey. Spiders eat insects, so homes populated by invading insects present a smorgasbord to spiders; particularly hunters like jumping spiders. Some spiders wander into homes looking for love. Amorous male Funnel Weaver Spiders (family Agelenidae) go on wanton walk-abouts in the fall looking for females and some of these lovelorn males may saunter into homes. An ounce of prevention is worth a pound of bugs. The best defense against home invaders buzzing or lumbering around inside a home is to prevent them from entering in the first place. Large openings created by the loss of old caulking around window frames or door jams provide easy access into homes. Such openings should be sealed using a good quality flexible caulk. Poorly attached home siding and rips in window screens also provide an open invitation. The same is true of worn-out exterior door sweeps including doors leading into attached garages; they may as well have an "enter here" sign hanging on them. Venture into the attic to look for unprotected vents, such as bathroom and kitchen vents, or unscreened attic vents. While in the attic, look for openings around soffits. Both lady beetles and stink bugs commonly crawl upwards when they land on outside walls; gaps created by loose-fitting soffits are gateways into home attics. If spiders find their way into homes, they should be gently ushered out. Spider are effective predators that eat insects. They play an important role in suppressing insect pest populations. Insects that find their way into a home should be dealt with carefully. Swatting or otherwise smashing these insects can cause more damage than leaving them alone since fluids inside their bodies can leave permanent stains on furniture, carpets, and walls. Also, mashing multicolored Asian lady beetles and brown marmorated stink bugs can release a lingering eau de bug; lady beetles have stinky blood and stink bugs are called stink bugs for a reason! Vacuum cleaners present their own set of risks. A "direct-fan" type of vacuum cleaner should never be considered; passing the refuse through an impeller would create a horrifying bug-blender! Even a "fan-bypass" type (e.g. Shop-Vac) with the refuse bypassing the impeller can develop a distinctive scent if used on stink bugs because the bugs will release their defense odor in response to swirling around inside the vacuum tank. However, fragrant misadventures with vacuum cleaners can be minimized with a slight modification involving using a nylon ankle sock as pictured below. 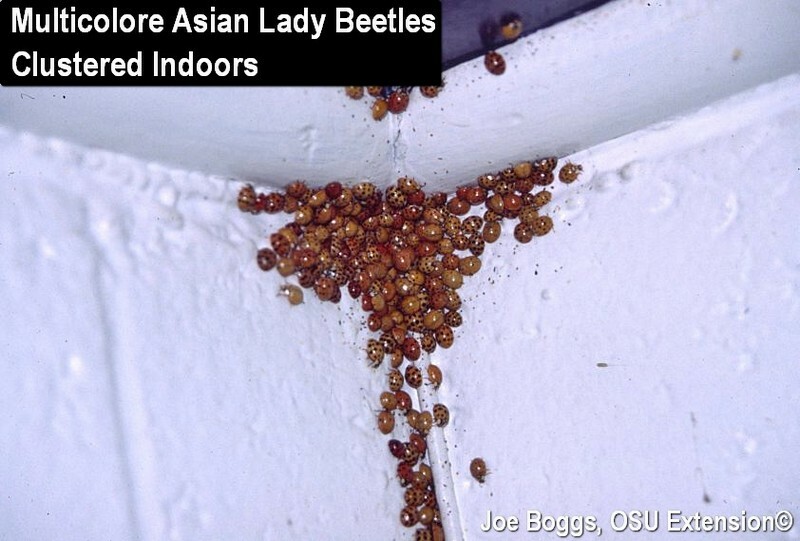 The method is clearly described in the OSU Factsheet titled, Multicolored Asian Lady Beetle (see "More Information" below). Small numbers of home invaders can be scooped-up and discarded by constructing a simple but effective "bug collector" using a plastic pint water bottle as pictured below. Large numbers of insects can be quickly dispatched by placing a small amount of soapy water in the bottom of the bug collector.